It's official. 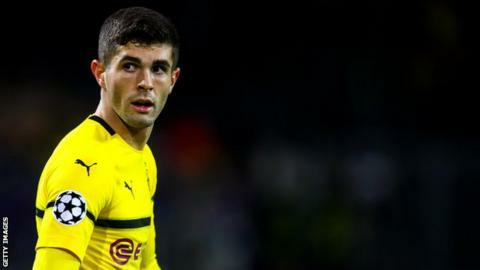 United States international Christian Pulisic is a Chelsea player - though, granted he will remain at Borussia Dortmund until the end of the current season. At £58m the 20-year-old becomes the most expensive American footballer, comfortably exceeding the 20m euros Wolfsburg paid for John Brooks in 2017. But while it may be a huge moment for Stateside soccer, the deal has been received differently around the globe. BBC Sport takes a look at the reaction in the USA and Germany. Can you name the top American scorers in the Premier League? Chelsea director Marina Granovskaia described Pulisic as "one of Europe's most sought-after young players", and the Blues' anticipation for the forward's arrival has been greeted with equal excitement back home. Soccer and the Premier League continue to grow in popularity in America, but the USA captain's switch to England's top-flight itself has been labelled "a monumental moment in American soccer" by NBC Sports. Similarly, the move has been described as "massive" by American sports magazine Sports Illustrated who believe Pulisic, following in the footsteps of compatriots Matt Miazga and Roy Wegerle at Stamford Bridge, now has the opportunity to become "the first global American men's soccer superstar". Others were keen to point out the obvious benefits of a new States connection for Roman Abramovich's club. In a tweet, American journalist Roger Bennett said the "blockbuster" move was "massive for the Premier League and its surging growth in the States", with Chelsea set to become the "shirt of choice" for aspiring young footballers across America. Likewise, away from the benefits to the sport in the States, NBC also acknowledged the shrewdness of Chelsea's business: "Chelsea aren't daft. They've just locked up the best player the U.S. has ever produced and will no doubt try and market Pulisic to boost their presence in the U.S. and North America. "Pulisic and Chelsea are good for one another from a business standpoint." This is not the first time a Premier League club has spent big money on a Bundesliga player. It will likely not be the last. This particular deal is one German newspaper Bild has described as on the "border" of "crazy", based on the conditions of the agreement. The whole thing is "madness" from Chelsea's perspective, the tabloid added. They say Dortmund have once again profited from the "irrationality" of the Premier League, as Chelsea splashed out 64m euros on a "positionally limited" player that, as a substitute more recently, has "stagnated". On a similar note, paper Die Welt credit Lucien Favre's Dortmund with securing the "perfect deal" for a player they believe had seen his time at the Westfalenstadion ended by England international Jadon Sancho - as the 18-year-old continues to shine since his move from Manchester City. And though the Pulisic move may seem "unusual", Der Tagesspiegel also suggest Eden Hazard's brother Thorgan may have already been identified as the player to "close the gap" left by the USA skipper. It was not all negative, of course, as German journalist Raphael Honigstein shared an earlier piece on the American's promise via Twitter. "It's not the player Pulisic is that other clubs covet, but the player he is likely to become," he said. "He's a good player," Klopp said on Wednesday. "I have known him for a while and followed him closely but it's a good deal for Dortmund because they can keep him until the end of the season and a good signing for Chelsea. We will see another really skilled boy playing in England."